Home > Blog > Welcome to our new blog series! My name is Valera and I am proud to head the Product Team as Product Owner at Easygenerator. Our company and product are all about finding agile ways of working. It’s my job to give you the best user experience possible, and that’s what makes it so rewarding. In addition to my work at Easygenerator, I’m also a university guest lecturer. I am passionate about teaching a new generation of professionals all about creating and delivering awesome, modern products that improve people’s lives. In everything I do, I am convinced that the only way to achieve great things is to go above and beyond what’s expected of you. At Easygenerator, our entire team shares this vision of exceeding expectations. That’s why we are continually working to improve our product. As we continue to improve Easygenerator, we want to keep you fully up to date on our latest developments. That’s why it’s my pleasure to welcome you to our new monthly blog series. 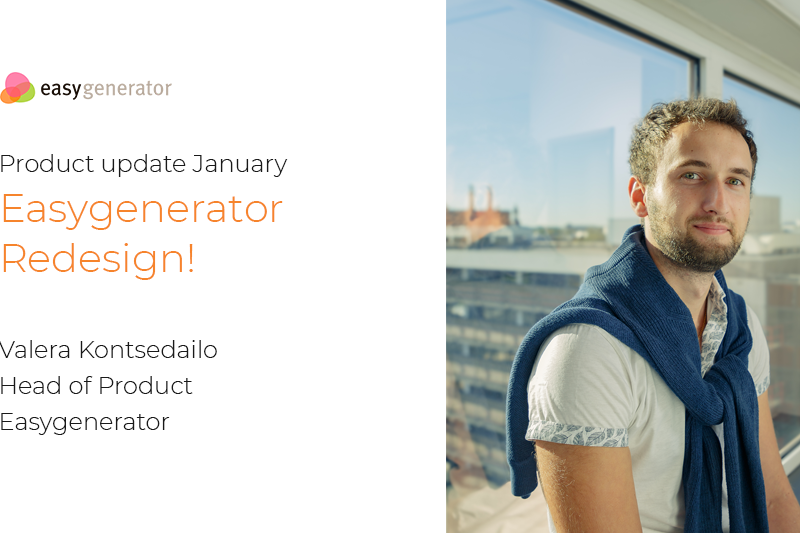 Each month, we’ll be highlighting what’s new from Easygenerator. This month, I want to focus on the new all-in-one template from Easygenerator. We’ve worked side by side with our customers to develop this all-new user experience. It combines the latest course design principles with a proven didactical approach. After extensively testing the all-in-one template, we’ve already seen a dramatic improvement in learner engagement, which is one of the top indicators of educational effectiveness. Learners who have completed courses built with the all-in-one template have consistently given higher ratings to their learning experience. This is measured using Easygenerator’s net promoter score (NPS) feature, which gives learners an opportunity to rate whether they would recommend a course or piece of content to their peers. Let’s take a look at what the new all-in-one template from Easygenerator is and why it’s such a powerful addition to our e-learning platform. What is the new all-in-one template? The new all-in-one template from Easygenerator is one of the most efficient and effective templates we’ve developed so far. 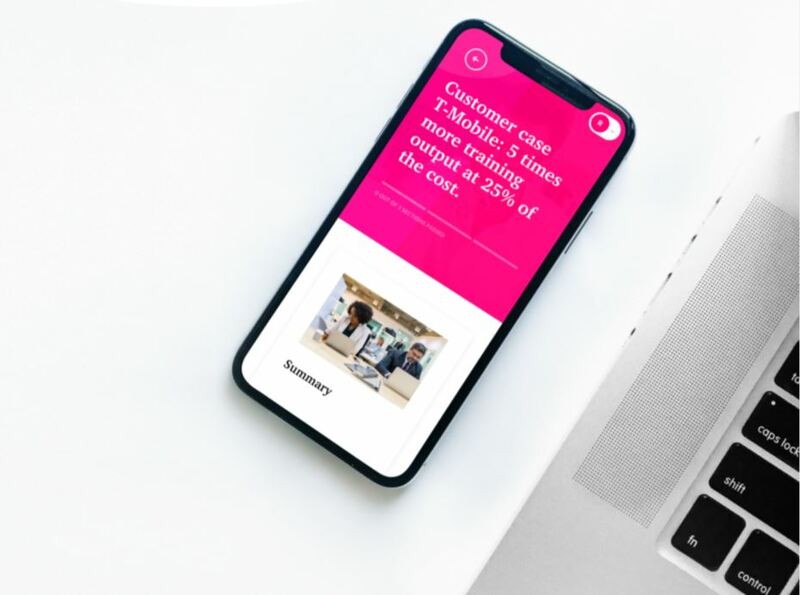 It automatically applies the latest user-experience (UX) principles, so it is much easier for learners to engage with the material in front of them. We also incorporated some of the best practices from e-learning, based on our extensive research and loads of input from many of our thousands of users around the world. The all-in-one template makes content more readable thanks to its optimized layout. It automatically controls whitespace to direct the learner’s attention in the most effective way possible. It also features fonts that have been proven to be ideal for engaging with the reader. Specially designed, animated transitions between screens keep the learner alert and interested in seeing what comes next. The action buttons in the template have also been strategically redesigned to create a more interactive learner experience. The results of our initial testing speak for themselves: the improved design of the all-in-one template has boosted learner satisfaction scores (NPS), meaning learners are more engaged than ever. Since learner engagement equals effective learning, the all-in-one template is a great addition to any e-learning author’s toolkit. With the all-in-one template, you never have to worry as an author about maintaining your learners’ attention. The template takes care of that for you now. How did Easygenerator develop the new all-in-one template? Over the past year, our valued customers have given us lots of insights about what they like most about the existing Easygenerator course templates. Templates make the course authoring process much quicker. They enable course authors to quickly reuse existing content and layouts without having to start from scratch each time they want to author a new piece of learning content. They also boost learner success rates by creating a more interactive learner experience. Based on your input, we decided it was time to offer a completely redesigned, new, all-in-one template. This new, all-in-one template gives your learners the best learning experience possible. It combines the latest, scientifically proven design principles with a highly effective didactical approach. Our Product Team of learning experts collaborated with the leading design agency in the Netherlands to carefully craft the new design. The goal was to apply scientific knowledge of user experience and learner engagement to produce the most effective e-learning authoring tool we’ve ever released. What are the benefits of the all-in-one template? With the all-in-one template, it’s easier than ever to customize content. You can easily brand your courses with the right color schemes, so you create a cohesive, branded experience for your learners. Our mobile template gives your learners the best mobile learning experience possible. You don't have to worry about anything: all your courses automatically adapt to any iOS or Android device. Revamping our course templates also enables us much more customized templates for you, because we have started implementing a new technology stack. We plan to create even more interactivity options and keep testing to continually improve the course templates. As you can see, we rely heavily on feedback from our users when developing innovative new features like the all-in-one template. You are the experts when it comes to explaining what you need and expect from our e-learning authoring tools. We hope you’ll continue to check in with us for our monthly product updates from now on. And we hope you’ll keep helping us improve our product by giving us your feedback. This way, we can help you to improve e-learning at your organization with the most powerful and effective authoring tools possible.